Observation - Murder mystery - UK and Ireland. 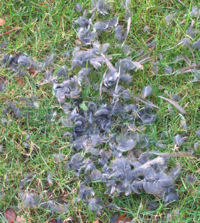 Description: A pile of feathers on the Cedar Lawn at Walton Hall, Milton Keynes. Looks Like a Woodpigeon, but whodunnit? I suspect a local Sparrowhawk! A pile of feathers on the Cedar Lawn at Walton Hall, Milton Keynes. Looks Like a Woodpigeon, but whodunnit? I suspect a local Sparrowhawk!